Kyoto is a popular city throughout the year. There are many spots where you can feel the history of Japan such as historical buildings in the old city where Japanese emotions are gone. We introduce such events that you can enjoy Kyoto now, including a traditional festival. There is also an event that children can enjoy. I’m sure your family can fully enjoy Kyoto. Let’s enjoy Kyoto in autumn. “Chushu no Meigetsu“ refers to the moon in the evening of the 15th August (Jugoya) on the lunar calendar. The word of “Meigetsu” means the exclusively full moon which rises in autumn evening. However, every August 15th (Jugoya) on the lunar calendar, the moon is not always the full moon. That depends on the year, and there’re times the full moon is on the day before or the next day August 16th. It is said that the custom of enjoying the moon started from around the Jomon period. The beginning of enjoying the moon was said that the Mid-Autumn Festival of China was transmitted, and it was popular even among the aristocrats in the Heian period. It seems that in the Heiankyo court it became an official event in the time of Emperor Murakami in 966. The Heian aristocrats graciously enjoyed the party and the moon by reflecting the moon on the pond and the glass without directly seeing the moon. 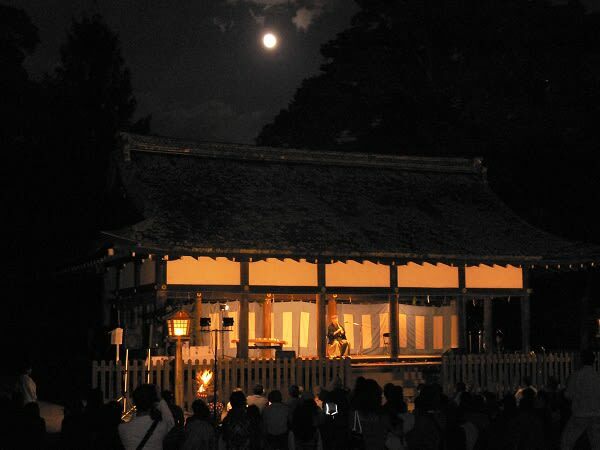 Even at Kamigamo Shrine, the event of seeing the moon from ancient times was well held. This year, the event to dedicate flowers and Noh will be carried out at 17:30, after the shrine ritual at the Umaba-dono. In addition, the first 300 guests will be given “Tsukimi Dango.” In addition, “Kamigamo Momiji-Ondo Dance” is also held in front of Torii at 20:00. Even the public people can participate, so why do not you enjoy the moon with traditional Japanese customs? Japan has a habit of enjoying the moon of October since long ago. Among them, Osawa Pond of Daikaku-ji is one of the three most famous moon viewing destinations in Japan. 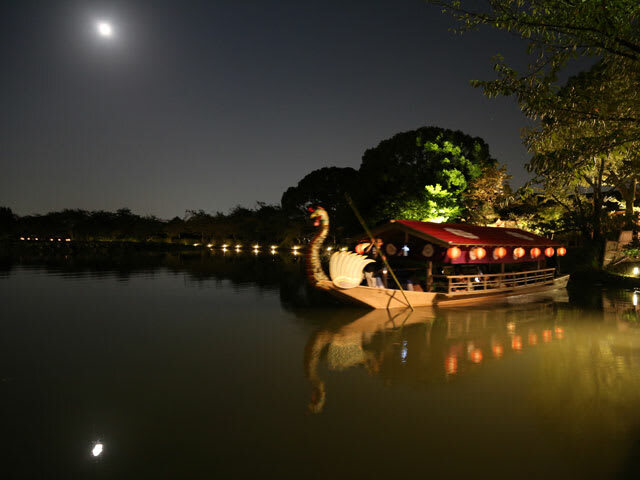 In the evening of the moon viewing, you can enjoy seeing the moon on a boat in Osawa pond. in the Heian period at the Imperial Palace (current Daikaku-ji) which was built by Emperor Saga, the Emperor Saga started playing with men of culture on the Osawa Pond at the beginning of the 9th century. During the event, following the old style, they float a boat in the pond, a tea ceremony is held, and the Koto musical instrument is played, and in the end an elegant moment like a Heian-period’s picture scroll will cover the venue. Kyoto Daikaku-ji is famous as a place for the historical plays. The moon reflected on the surface of the water and the fantastic scenery of the shadow of the “Gekishu ship” make you feel as if you were in the old period. There is no doubt that you can enjoy Kyoto’s unique way of enjoying the moon. It is an opportunity to feel Japanese history. If you go by train, you will walk long from the station, but it is worthwhile visiting there. *You can purchase up to 4 tickets per person. Scheduled to start sales around 3 pm. The ticket to enter the temple is charged separately. It may change depending on circumstances. You can choose the ticket for 17 o’clock, 18 o’clock, 19 o’clock, or 20 o’clock. As soon as tickets on the day are gone, sales will end. Because those having the same ticket are lined up at the same time, it may not be possible to board the ship at the boarding time. We do not accept the booking in advance at all. There is a case that we can issue a numbered ticket before the sales start time. *Depending on the weather etc., the scheduled time may go back and forth, or the operation may be canceled. Daitoku-ji was built in the land of Murasakino of Rakuhoku-area by Daitokokushi. After a long history, it is now a Zen temple with a vast area on Kita-Oji-Dori of Kita-area, which is located on the north side of Kyoto City. In this special public, for the first time at Daitoku-ji, the treasures such as “Oda Nobunaga-ko zou” by Kano Eitoku (only in the first half exhibition), “Toyotomi Dai-myojin zou” in the Momoyama period, and “Tenzuijiden (Omandokoro) zou” will be displayed specially. In addition to National Treasure “Hojo” and “Hojo Shohekiga” by Kano Tanyu, Karamon and Tenjo-Ryu of the Hall will be also seen. 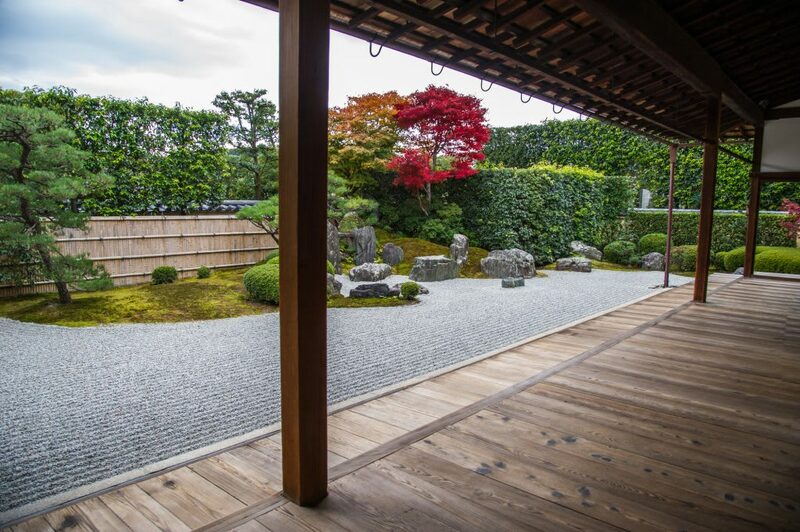 Not only exhibits but also historic, special scenic garden “Hojo garden” is magnificent. 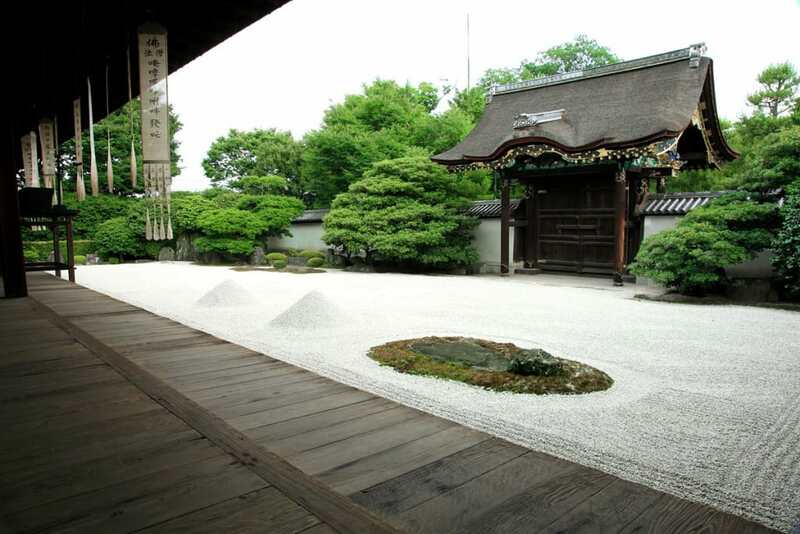 The front yard is a public place, and Zen’s state is expressed by Karesansui using stone and white sand. While feeling history and tradition, it is a space that you can feel pious. You should absolutely see these first public exhibits. Nijo Castle is a Japanese castle built in the Edo period, located in Nijojo-cho of Ward Nakagyo, Kyoto. It is a castle built on the flat land in Kyoto by Ashikaga, Oda, Toyotomi, Tokugawa, and today you can see that by Tokugawa. In modern times, Nijo Castle has been used as a prefectural office of the Kyoto Prefecture and the imperial home of the Imperial family. In the ex-imperial Nijo castle, the original painting “Ninomarugoden-shohekiga” (an important cultural property) is now being displayed four times in a year due to “400 Years Built Memorial Exhibition and Collection Hall”. This is a part of the ex-imperial Nijo castle “400 Years Built Memorial Exhibition and Collection Hall’ exhibition project, currently “Restoration of the Imperial rule; 150th Anniversary Exhibition 2nd: The stage of history; Wall paintings of Ichi-no-ma room, Ni-no-ma room” is being held. The Wall paintings of Ichi-no-ma room and Ni-no-ma room are those painted on the wall of the first or second room, where Tokugawa Yoshinobu told the director of each clan (Han) the determination of Restoration of the Imperial rule. Paintings on the north face shows that as if protecting the general, the giant pine tree stretches the branch, and the sliding doors and the wall on the east side shows golden pheasants and peacocks which came to Japan as donation items symbolize the power of the general. It is the first attempt that we can see all the Wall paintings of Ichi-no-ma room and Ni-no-ma room at the same time. Let’s take a closer look on this opportunity. Kyoto National Museum is a museum operated by National Institutes for Cultural Heritage. It opened in May, 1897. In addition to gathering, storing and exhibiting cultural heritages, centered on the culture of Kyoto mainly from the Heian period to the Edo period, they do the research and the dissemination on cultural heritages. A special exhibition will be held at the moment when Kyoto National Museum celebrates its 120th anniversary, where “National Treasures” that show the Japanese eternal history will be displayed at the same time. The year of 2017 is also the 120th year since the legislation “Kosyaji-Hozon Law”, when the word “Kokuho – national treasure -” was used for the first time, which is the forerunner of the cultural heritage protection law was enacted. In this exhibition, the national treasures collected from various fields such as paintings, sculptures, archeology, etc., such as “Kichijoten Statue”, “Kakitsubata-ByobuOgata” by Ogata Korin, Dogu (the goddess in the Jomon period) or “Kan-no-wa-no-na-no-kokuo Stamp” etc. are displayed, divided into four periods. “The six national treasures by Sesshu in only one room”, “Miraculous parent-child co-starring by Hasegawa Tohaku and Hisakura”, these are exciting exhibitions thanks to this time. It is a unique opportunity that approximately 200 national treasures, about a quarter of the 885 arts and crafts designated as National Treasures, are displayed. Let’s go and see. There is an exhibition change during the term. For college and high school students, please show your student ID card. *If you are a campus member, you will be charge group fee when you show your student ID card. “SORA FES 2017 – Scenery Only Here -” is held mainly at Kyoto Arashiyama “Horin-ji Temple” deeply related to the universe on October 8, 2017. “SORA FES” is an event that gathers various ways of enjoying the starry sky together, such as fashion, science, outdoor, etc., with the common words “Face up and play!”. It began in 2014, and this is the fourth time. In addition to the art exhibition that makes you feel the universe, the craft market of cosmic motif, cafe, science workshop etc. are opened. The topic you should pay attention this year is ​​an art exhibition that makes you feel the universe at the main venue “Horin-ji”. On the observation deck where you can see the sky and the cityscape of Arashiyama and the precinct of the temple where “Kokuzo-Bosatsu” with the name “Koku” meaning the sky (universe) exists, you can see the collaboration with art objects and the scenery of the sky changing from moment to moment. Also, workshops and market areas are set up in the precinct of the temple, and “SORA×Cafe” corner where foods & cafes with the theme of the stars or the universe gather will be set up on the observation deck. While enjoying foods and drinks, loving the moon and stars in the sky and the moon reflected on the river surface, you can experience “Scenery Only Here” at Togetsukyo Bashi area, which is a sight of Arashiyama. A treasure hunting game will be held in Tanba-Kameyama Jyokamachi. Tanba-Kameyama Jyokamachi is a castle town of Tamba Kameyama, which Akechi Mitsuhide ruled. Even now, in the streets, some old shop houses of Kyo-go-shi which roofs’ shape is like the Japanese character “He” after the book is opened remains, and the atmosphere when it was a castle town can be felt. In addition, Tamba Kameyama Castle was built by Akechi Mitsuhide following Nobunaga’s order as a base to capture Tamba-area. It is famous for the history that Mitsuhide headed for Honno-ji with the army here from Tamba Kameyama castle when Honno-ji incident occurred. After under the rule of the Toyotomi family, during the Edo era, it was repaired largely by the order of Edo Shogunate in the territory of Todo Takatora. The castle was destroyed due to an order for abandoning castles in the Meiji era and the land was acquired by a new religious group, and they destroyed and altered such as re-piling Ishigaki, and the remains at that time were lost. Parts of the castle ruins are open to the public. A treasure hunting game that is perfect for walking around such a historical town will be held. Anyone can participate by receiving “Treasure Hunting goods” at Tourist Information Center in JR Kameoka Station. Decipher the hidden mystery within the search range, do a discovery report (once a person), clear the game, and you will get the special goods. Let’s enjoy strolling along the old castle town where Akechi Mitsuhide built the foundation. An exhibition composed of winning works of “World Press Photo Contest” will be held. “World Press Photo Exhibition” was founded in 1955 in Amsterdam, the Netherlands, by the World Press Photo Photography Foundation. It is an exhibition of documentary and press photographs that began in the following year. Every year, from January to February, “World Press Photo Contest” targeting pictures mainly taken in the previous year is held and the prize-winning works selected by ten international judges are exhibited as “World Press Photo Exhibition Works” all over the world. Approximately 5,000 professional photographers from 125 countries and regions participated this year and among the more than 80,000 entries, the 45 winners’ works of the eight fields will be displayed. It is a valuable opportunity to see the “now” in the world of giving you the shock and impression that you cannot normally have through from conflicts, environmental problems, critical moments of sports to daily scenes. Why not touch the “now” in the world here in Kyoto? Cosmos garden in Kameoka-city full of nature is one of the largest gardens in Kansai-aera. 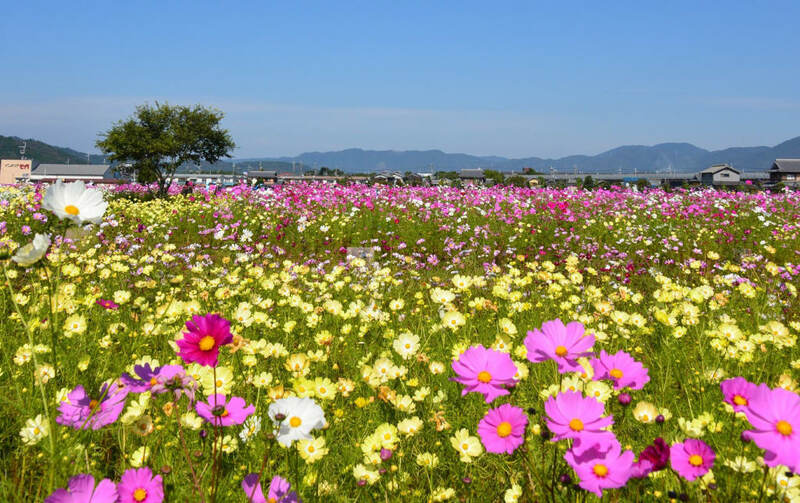 The scenery that about 8 million, 20 kinds of cosmos breathe in the wind in ​about 4.0ha area is a masterpiece. There are also early-bloom varieties, and you can enjoy them even at the beginning of the period. In addition to the kind of cosmos “Sensation” you often see, there are various rare varieties such as “Yellow Campus”, “Happy Ring”, “Double Click”, and “Psyche”. Walking and seeing, there is no doubt that there are new discoveries. Inside the park, events such as “Tamba Food Market” where the taste of Tamba-Kameoka gathers in one place, and “Creative Scarecrow Contest” with plenty of humorous works are also held. There are also dog run corners and cut flower sales corners. Also, only on Saturdays, Sundays and holidays, “Cosmos Concert” is underway by the variety of music such as brass band, Koto, Shakuhachi, quena, or violin performance. Why do not you listen to music in nature? If you spend your leisurely day in nature, you will be able to refresh your mood. Kohrin-in, Tatyu-jiin in Rinzai-syu Daitoku-ji, is open to the public every spring and autumn only. In 1581, the main temple roof was restored by Maeda Toshiie who served as one person of chief ministers of the Toyotomi administration, and it is a temple which became the Maeda family’s family temple. In addition to being able to see the main gate of important cultural assets, the elegant and restful main hall, and the Hojo garden restored by the artist Nakane Kinsaku who was said to be “Showa no Kobori Enshu”, you can enjoy red leaves in autumn. Both the main gate and the main hall (including Kara-mon) where the appearance at the time of its establishment remains are designated as important cultural heritages. Let’s go to see red leaves in autumn and Daitoku-ji Kohrin-in opened specially to the public. Red leaves in autumn in Kyoto are super wonderful. You can enjoy the historical town Kyoto’s atmosphere in the red leaves.